Jury Trial Considerations: Directed Verdict and the Verdict Form - В сложной финансовой ситуации приходит на помощь кредит наличными в Казахстане. Previously, I discussed a motion for directed verdict and, then, a motion to set aside a jury’s verdict. This is an important procedural vehicle to know because a party opposing a claim generally always moves for a direct verdict. 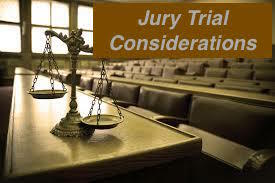 In some instances, the court reserves ruling on the directed verdict to see how the jury decides the case. If the jury enters a verdict in favor of the party moving for a directed verdict (e.g., the defendant) then the court does not need to rule on the motion for directed verdict (it becomes moot). Recently, I wrote an article about a case involving a jury trial as to the enforcement of an oral contract. During the jury trial, the party opposing the oral contract’s enforcement–the defendant–moved for a directed verdict. The trial court reserved ruling on the motion for directed verdict to see how the jury would decide the case. The jury entered a verdict in favor of the plaintiff. Based on the verdict, however, the trial court granted the motion for directed verdict and entered judgment in favor of the defendant. The plaintiff appealed the trial court’s ruling and the First District Court of Appeal reversed the trial court and directed judgment in favor of the plaintiff consistent with the jury’s verdict. Loper v. Weather Shield Manufacturing, 40 Fla. L. Weekly D1492a (Fla. 1st DCA 2015) (internal citation and quotation omitted). The case also references a special interrogatory verdict form which is a verdict form that asks the jury to answer specific questions relating to a plaintiff’s claim against a defendant and a defendant’s affirmative defenses. In this case, a special interrogatory verdict form was submitted to the jury with carefully crafted questions. The jury answered questions on the verdict form benefitting the plaintiff that led to its verdict in favor of the plaintiff. Did Michael Loper [owner] and Weather Shield Manufacturing, Inc. [manufacturer], enter into an oral agreement regarding the windows at the Loper home? Did at least one of the parties (Michael Loper and/or Weather Shield Manufacturing, Inc.) fully perform his or its responsibilities under the oral agreement and do so within one year of that agreement? Did Michael Loper: (a) orally agree not to file a lawsuit against Weather Shield Manufacturing, Inc., in exchange for replacement of all defective windows and a new ten-year warranty; (b) reasonably rely in good faith on Weather Shield Manufacturing, Inc., to reduce this oral agreement to writing; and (c) reasonably rely on Weather Shield Manufacturing, Inc.’s words and action to change his position to his detriment? Did Weather Shield Manufacturing, Inc. breach the oral agreement? Did Michael Loper sustain damages as a result of Weather Shield Manufacturing, Inc.’s breach of the oral contract?